At 38, Jessie McBride thinks her chances for romance are behind her and, after her failed marriage, she's fine with that. 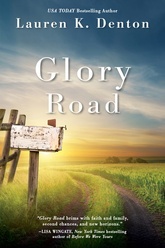 She lives contentedly with her fiery mother and her headstrong daughter in Perry, Alabama. But the arrival of two men in town make her question if she's really happy with the status quo. Meanwhile, Jessie's daughter is approaching the start of high school and trying to navigate a new world of emotions—particularly as they relate to a cute neighbor. At the same time, Jessie's mother increasingly finds herself forgetful and faces a potentially frightening future. As all three women navigate the uncertain paths of their hearts and futures, one summer promises to bring change—whether they're ready for it or not. Lauren K. Denton is the bestselling author of The Hideaway and Hurricane Season. She was born and raised in Mobile, Alabama, and now lives with her husband and two daughters in Homewood, just outside Birmingham.